Artistic railings on the interior and exterior structures of a house, with multilevel balconies, is a creative showpiece. This custom home design was in need of equally unique railings. With so many options in handrails, there are very few that have truly random designs, where everything is unique. These artistic handrails all have different shapes and patterns since they are made with sticks and branches from the mountain laurel tree. Architectural details, such as the glass windows and plank floorboards, create stark and stunning geometrical forms. At the same time, branches in the handrails soften the look with their sinuous shapes. As a finishing touch, a long Mountain Laurel branch with its natural curve serves as a banister along the foyer steps. They are enhancing the beauty of your living place through their real designs just like decorative elements. Notice in the picture how branch railings convey spaciousness by opening up the view to the lower and upper balconies. Instead of looking at a half wall or boring vertical balusters, visitors focus their eyes on an artistic twig and branch railings with awe. In a lounge or hotel, they would give a classic look with artistic beauty that can enhance the value of your property. Visitors would love to come closer to feel the easiness and beauty of the wooden structure. This creative idea can give an excellent look to the balconies of your rooms through their primitive designing. After their installation, you can get a good cost of your investment in the future as the value of your home and premises are increased. Most of us like to live in the soothing and peaceful company of nature. If you want to give this company to your customers by changing the interior and exterior look of your resort, the artistic outdoor railings can be the best idea. Its beautiful classic and natural look would give you the feeling as if you are living in the lap of nature. They would best suit the outside balconies and areas of the resort garden where you can enjoy the natural sceneries standing alone. Our professionals always have the obligations of meeting the customer’s demands and needs by making use of the surroundings in a natural way, and ascertaining that the basics of railing design and construction are met and even surpassed. The artistic railings on the exterior balconies coordinate seamlessly with those in the interior for a cohesive look. 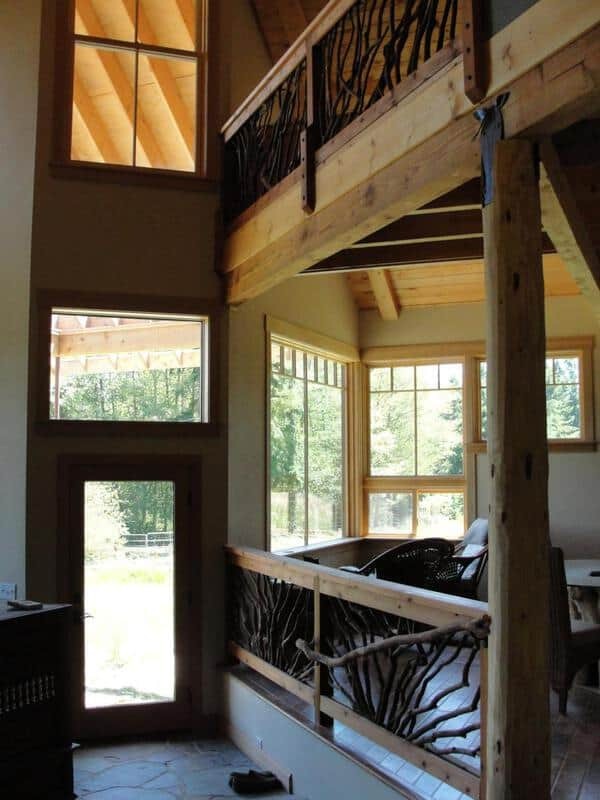 That’s the beauty of Mountain Laurel Handrails —- they work equally well inside or out. Incidentally, the curious dog appears very content enjoying the unobstructed view from the balcony. Many times, your kids would have insisted you have a look at a sight that you would have observed near a wall of your house but they could not have due to their small heights. You can fulfill their wishes by installing artistic railings. Their beautiful construction with natural materials can enable your kids to watch any natural sight through the gap of twigs. Apart from this, they could also provide safety or protection to your children. We needed to create a design that would utilize the environment’s strengths in a creative manner to arrive at a unified as well as a complementary whole. The project here was unique in itself as it incorporates exciting creative challenges. 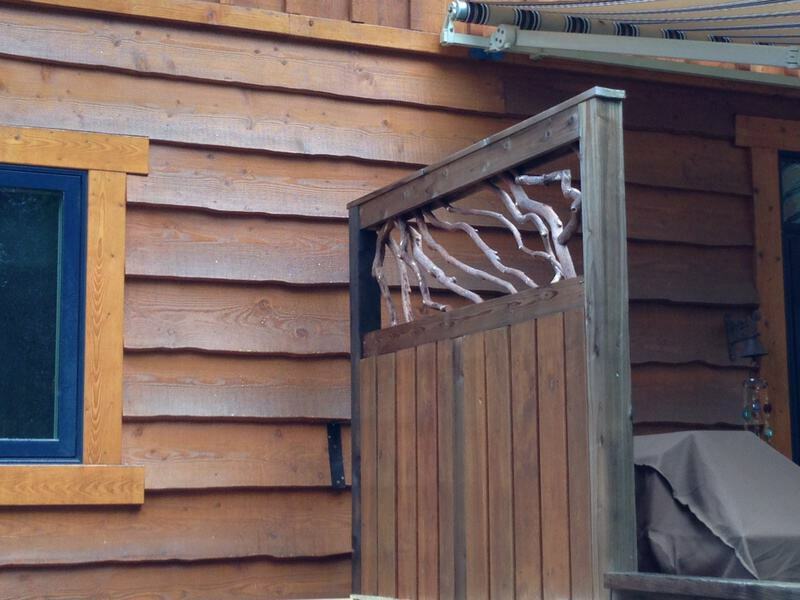 A warm and natural wood railing in the form of branches give your balcony or stairway a soft and organic appearance. 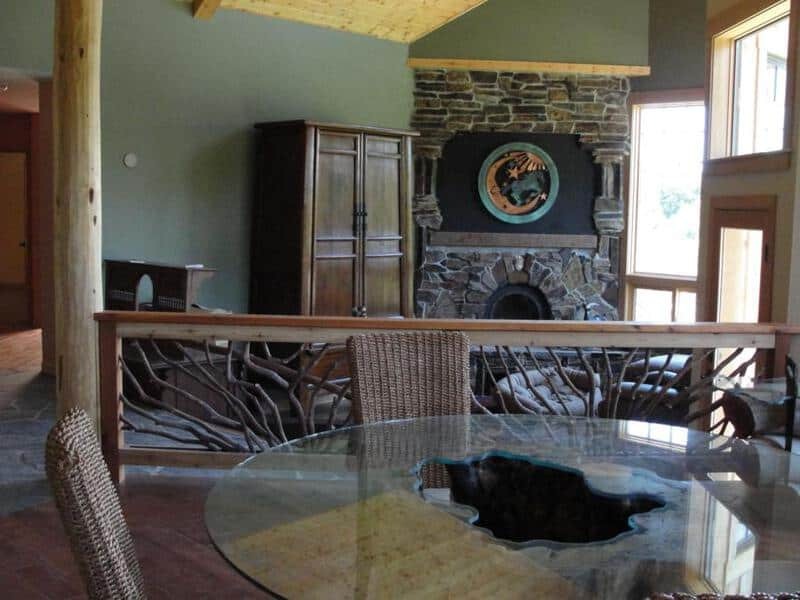 In the picture below, the railing functions as a divider and safety feature for the split-level, sunken room. But that’s not all. 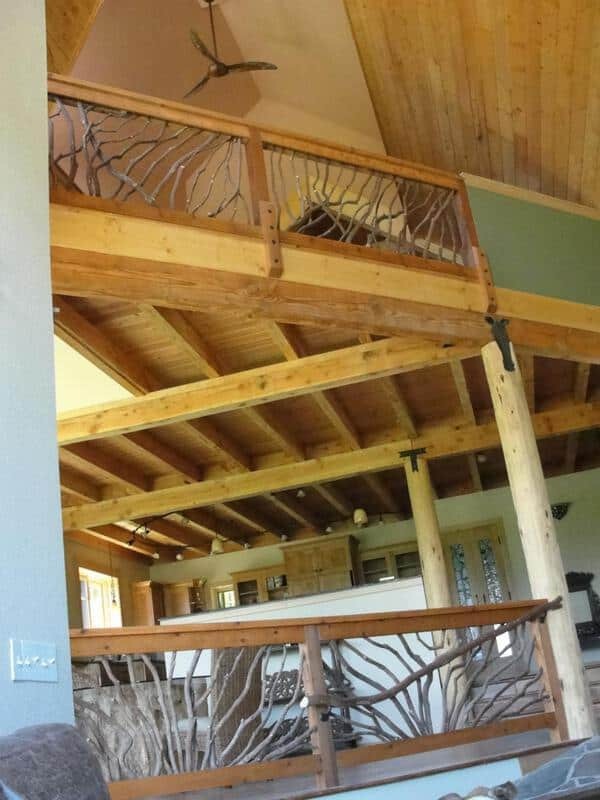 A Mountain Laurel railing filled with uniquely shaped branches stands out as a work of art. Here, meandering twigs cluster in the center on the bottom rail and then flare up and out creating a picturesque design. They are increasing the beauty of the interiors of your living place. The natural design of branches can also give you the feeling as if you are sitting under a tree. The wood and timber material give a sophisticated and classic touch to your home. Their artistic designing gives a completely different look from a steel and iron railing. These handrails are durable as well as sturdy. Due to their great strength, they can bear more weight than other soft materials. 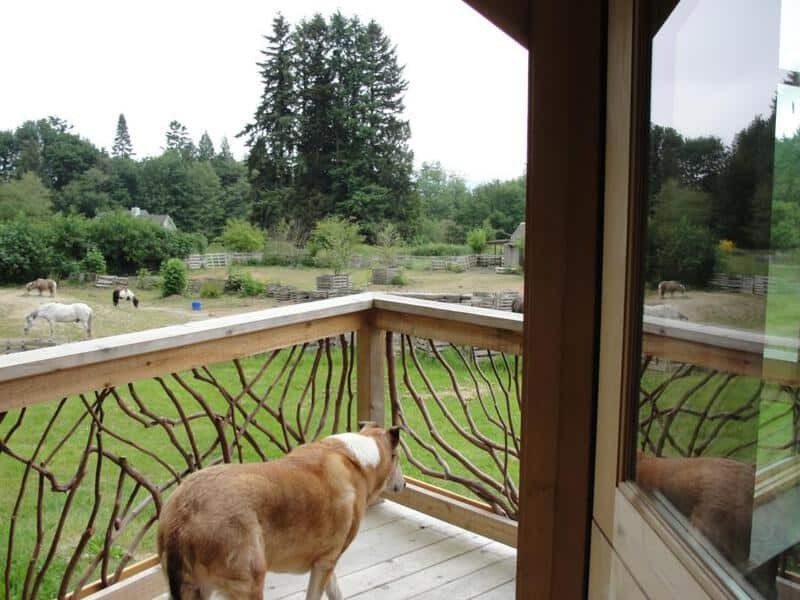 You can choose the height and width of the railing as per your need and choice. A too short height of railings can be a danger to the safety of yourself and others. Similarly, a too tall height would deteriorate the beauty of your home. So, it is better to make a proper planning for a suitable height and width of the railings in your home. See in this picture how the silhouettes of the branches when lit from behind look sinuous and shapely. As each day progresses, the character of the handrail also changes since the light strikes differently throughout the day. Most homeowners like to have textures and designs of their house that could give a natural look. The same they expect from a railing also. If they use steel, iron or mortar for this purpose, they may fail to get that look. Steel and iron are hard metals that may give your home a boring and disappointing appearance. They also not look natural from any angles. Hence, to get a natural feeling, you would need to have a natural element like wood. These aesthetic handrails are made with sticks and branches of the mountain laurel tree. They are strong, flexible and gives natural appearance from all angles. Due to these qualities, they can be used in different shapes and patterns as per your requirements. They have their own strength and durability that make them useful for years to come. Some persons love the artwork and like to collect such items in their home. They often search these designs to make their office or living place look like an ideal symbol of art. These guard rails suit their purposes perfectly well. With their exceptional artistic beauty, they look embodiments of art that can be utilized at any place of your liking. And with pieces like this Framed Mountain Laurel Art, you can also hang them from the walls to complete the motif. Artistic railings on the interior and exterior balconies are much more than a safety element—it makes the most creative and attractive design feature. Carpenters working in woodshops nestled in the Smoky Mountains produce magnificent works of art for your deck, balcony, and stairs. In this picture, you can see the railing which is giving a classical primitive look to your house. Apart from separating the dining room from the living room, it gives sight of both places through the gaps of the branches. You can have a feeling as if you are living in the beautiful house of your dreams. After installing them, you need not spend extra money to decorate the house for some holidays. Just by applying some lighting over these twigs, you can enhance the beauty of your house for any party or occasion. In the morning or evening, while drinking your coffee or tea, sitting near these creative works, you can enjoy the beauty of them closely. You can get the inspiration of working happily like nature and would feel worthy in this creation of God. The woods in their natural form carry the same qualities which are found in their tree forms. So, you can enjoy the touch and texture of the same natural wood while interacting with these railings on daily basis. An artistic railing with its aesthetic form and appearance solve many purposes at one time. Apart from enhancing the elegance and grace of your living place or office, they give your building a different style and form. With appropriate maintenance and care, they can stay years after years in their natural form. The most attractive part of these railings is that they meet the inventive and aesthetic needs of art-loving people.